A place so famous you ask anyone and they’ll point you towards it. La Troja is a fun filled pub located on Calle 74 where you can have some of the best Salsa action going on. The place is perfect for a weekend trip with friends and loved ones. Apart from the dance La Troja has a great collection of cheap booze and good food. A must visit. How popular is La Troja? People normally club together Centro Comercial Buenavista and Catedral Metropolitana Maria Reina while planning their visit to La Troja. Super hot place. Drinks are served by well-trained people. there are many places where you can sit down and enjoy the music played on vinyl discs. Many people go there to dance Colombian salsa as well as African music and local folklore. This place is a must go whenever you visit the north of Barranquilla in Columbia. this place has been declared cultural patrimonial by Unesco. I recommend this place without hesitation. You must be aware that music played into this building is very very very loud and it could damage your hearing. Be aware of that fact before entering. The place to dance non stop. Cheap and awesome music. Best place to drink some beers and feel the behavior barranquillero ! 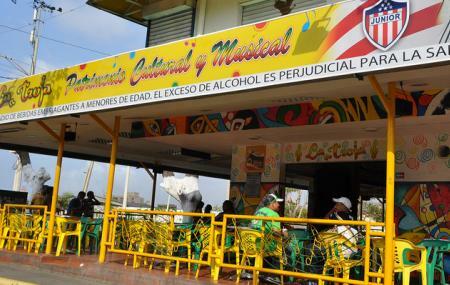 The best place in Barranquilla, music of Salsa and Afrika enjoying with a bear, is the most. When visiting Barranquilla it's absolutely necessary to come to La Troja. Enjoy the music and the environment. You won't regret it!